What is the point in being a guide if you don’t use the opportunity to see the world at the same time? I’ve always asked myself that and it is a principle that I will maintain. I have been very fortunate to of been able to work in some amazing countries. However, I am always aiming to add to my checklist! In November 2015 I was getting itchy feet, thinking about where I wanted to go for the summer. I had a few ideas in my head, but there was one that stuck out the most. 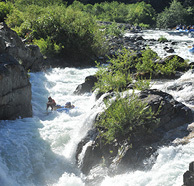 It was my dream to be a whitewater raft guide in Northern California. I had seen and heard about some fantastic rivers over there. That was it, my mind was set and that was where I was heading. It didn’t take long before my excitement was dampened. Unfortunately, it looked pretty much impossible for to get over there. There was only one way for me to get over there and work… well legally anyway. My only hope was to get sponsored, in which I thought I had no chance in hell. I mean, what company would pay to get me over there when there are some fantastic guides waiting on their doorstep? Well, after sending emails to various companies, I got a reply. The email came from Norm, who is the main man at Whitewater Excitement. It was exactly the news I wanted and hoped for! He told me that he was going to be sponsoring four international guides. We Skyped and at the end of the call he offered me a position. I didn’t know what I had done to deserve the job, but I was prepared to grab it with both hands and embrace it. The Visa process was next. This was a long and drawn out process, in which months past and still nothing happened. Despite Norm’s best efforts, the Visa’s took their sweet time. But at the start of May they came through. After visiting the US embassy in Ireland, filling out forms and various paper work I was almost there. All I had to do was book my flights. Admin was done and before I knew it I was in the airport on my way. I was traveling with Aaron, who was the other international guide that was going to be working with me in California. I was really excited to just get there, but we all know that it can’t all be plain sailing. After a delay in the airport lasting twenty seven hours and having Aaron nipping at my ears throughout the whole process (the boy can talk), I was ready to get on the plane. It felt like a lifetime, but we finally arrived in California. Norm and his prodigal son, Phillip, greeted us. We quickly learned that all the effort was so worth the fight. 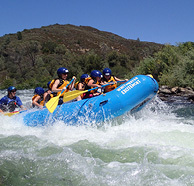 The next morning we decided to tag along on a trip on an American river rafting trip. 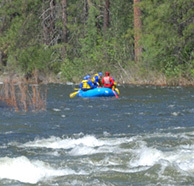 Aaron and I jumped in one of the new 13ft rafts that are used for rafting on this river. We were aware that the South Fork of the American was the easier river that we would be doing this season, so we weren’t expecting much….How wrong we were! There were so many brilliant rapids straight off the bat such as Meatgrinder, Racehorse bend and Troublemaker, to name a few. It felt a little surreal to be in a place that I was only dreaming about a couple of months ago. We were giggling like little girls and we just couldn’t believe our luck. After 11 miles, next up was lunch! The lunch spreads provided by Whitewater Excitement, were some of the best I’d ever seen a company do! I knew I wasn’t going to go hungry for the summer that is for sure. Once we had finished our lunch, we got back on the river. Next up was the ‘gorge’ section! I wasn’t feeling my best after consuming to much food, luckily I was feeling a bit better by the time we hit the first class 3 rapid, Fowlers rock. After Fowlers, it was one rapid after another each one was more fun than the last. I loved some of the names – Satan’s Cesspool, Deadman’s Drop, Bouncing Rock and we ended with Hospital Bar. It was a super fun wave to finish my first day off. Lake Folsom was high and it would be long paddle in flat water to the take out. Fortunately, a jet ski comes to tow us all out. Once we got to the take out, there was a whole selection of Soda’s and Candy Bars to choose from. It just kept getting better and better. My first day with Whitewater Excitement had left a very good impression. I knew I had made the right choice and couldn’t wait to get the season going.